Today I saw my neuroendocrinologist and my neurosurgeon. After going over my test results for the last 3 weeks, we decided that a second surgery is probably the way to go at this point. I am overwhelmed by all of this, but a little bit relieved too. 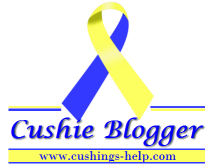 I have noticed the last week especially that I feel worse than I did before the surgery as far as my Cushing's symptoms go. I have had high blood pressure, more weight gain, swelling, and I haven't been sleeping at night. All of these symptoms seemed to be enough information for the doctors to go ahead with the surgery before we get the next results. It's nice to know that I'm not fighting for a diagnosis anymore! My surgery is set for January 28th as of right now, and as soon as we have an updated MRI and some more test results we'll be good to go.